To most people, the bathroom is their personal sanctuary. It’s so much more than just a place to wash up. It’s more like a personal spa, where you can relieve the stress of the day and just relax. When planning a bathroom remodel, you’re not only creating a practical, functional bathing space, you are carving out a little portion of your home where you can be yourself and get centered. Bathroom vanities in Corona CA play a big part in your bathroom remodeling project because this is where you’ll do a bulk of your prepping each day. Check out these five hot trends in bathroom vanities for 2018. A vanity is nothing without good lighting. After all, this is where you’ll be applying your makeup, washing up and prepping for the day. Optimal lighting will make or break your experience. We’ve all been in bathrooms where we look horrible, either because the lighting is too harsh or too dim. Today’s design trends are focusing on lighting schemes. In order to highlight this functional space, homeowners are getting creative with lighting techniques, fixtures and dimmers in order to present a more luxurious and relaxing space. You have many lighting style options at your disposal, such as light bars, wall sconces and small pendants. A blend of task lighting and overall lighting will work best. White, antique white, ebony and gray vanities are making a splash on the scene this year, as they go with pretty much any bathroom style or color. These neutral tones will also help make small spaces seem larger, plus they will last the test of time due to their classic nature. Mix and match coloring for maximum impact. An ebony vanity, for instance, will contrast nicely with a light white counter top. If you plan to sell your house anytime soon, these classic colors will resonate with potential buyers. This has been a growing trend, noted for both its style and the space it affords. Open shelving gives your bathroom a more luxurious and spa-like feel (just picture white folded towels in those slots), plus you can achieve a friendlier and more inviting look. Perhaps most importantly, it can make small spaces look larger. Try a vanity with an open shelf at the bottom, or you can always augment the vanity you choose by building in extra open shelving on the walls. Cabinets that go flat to the bottom are out and open bottom vanities are in. That’s because they add more space and give the bathroom a less cluttered feel. If you decide to add a new vanity without updating your flooring, it’s important that your tiles reach all the way to the wall. You may have seen this trend in restaurants. It’s now becoming more popular in home bathrooms. Not only can you adjust the height, you get a more open space which is ideal in a small bathroom. They tend to be sleek and stylish, resembling a piece of artwork. Now that you know how hot bathroom vanities are right now, it’s time to invest in some. Bathroom vanities in San Diego are available at wholesale prices to save you money. There are many styles of factory-assembled bathroom vanities in this region, all varying according to texture, design and style requirements. For instance, you can get a single bowl bathroom sink cabinet separate from double ones. Or, choose from tall and wide linen cabinets along with space-saving corner traps. Most of the styles are available with extended height for a more impressive look. Wholesale bathroom vanities are available in San Diego that incorporate top-quality materials. Solid granite tops are currently a popular choice, varying in sizes that match the vanities above. With at least seven kinds of granite colors, you can achieve the perfect combination of vanity and elegance. Easily available at wholesale prices here at Summit Cabinets, you can rest assured you’re getting top-notch quality. The granite tops are cut, drilled and polished along with the best kind of porcelain bowls ready for installation. We also offer marble tops with a clean one-piece top, with 10 colors to choose from. In a nutshell, wholesale prices increase the value of the product, making bathroom vanities extremely easy to use, convenient, beautiful and functional. 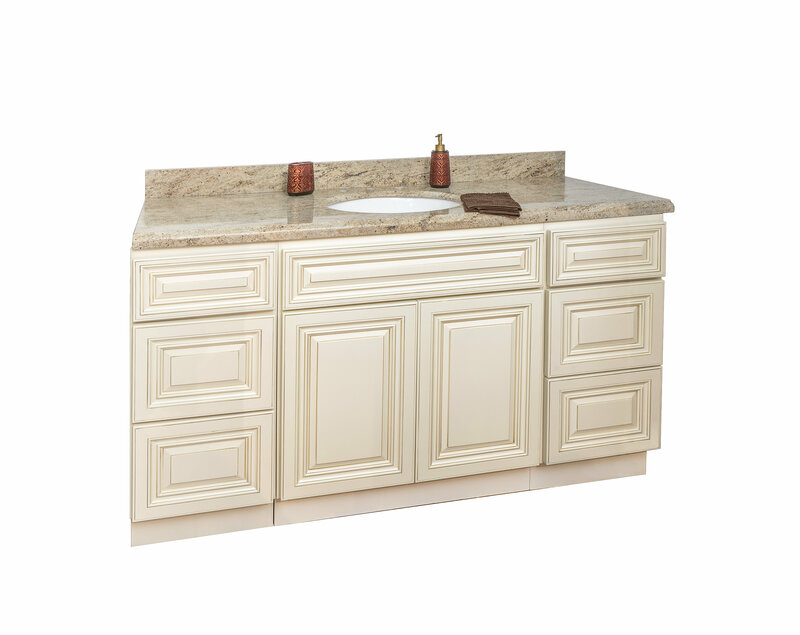 Summit Cabinets has just the right bathroom vanity for you. Contact us today at 909-980-0700 to learn more or browse our selection online.